As I discussed in an earlier post, Search Engine Optimization is still a thing. We have known for years that search engines and their bots crawl website content, penalizing websites that use shady tactics, such as keyword stuffing, irrelevant link building, and poor user experience. So how do you properly optimize your content? How do you boost your organic search engine traffic? Courtesy of Dilbert Comics by Scott Adams. About four months ago, after being asked if my team was “doing everything we can” to optimize search engine traffic, I started to investigate ways to bolster our existing efforts. (Recall: I work for a B2B professional services organization; my organization’s search engine traffic numbers are in line with the industry average reported by Search Engine Land.) But I was looking for a logical solution to the SEO conundrum, off my team went to Google Adwords for keyword ideas. We now use the knowledge gained from knowing the terms and phrases sought by those seeking information in certain sectors and modifying our content so, front-end and meta data. 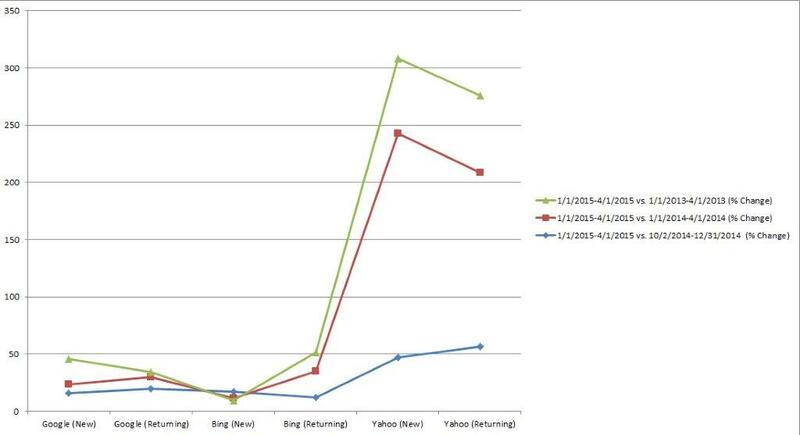 To test whether my strategy is working, I ran a comparative report on all organic search engine traffic. Stats for the last three months, this year compared to last year; revealed the following increase in percentage of visitors coming from Google and Yahoo with decreased new traffic from Bing. Out of curiosity, I took a look at the numbers for the last six months versus the latter time period and 2013 versus 2014. There is a significant jump in the current numbers and I believe the increases are large enough to stay the course and watch the progress. Another key to good writing is highlighting sources, or other independent corroborating sites as links within the text. However, I caution you to link the relevant text, not: see it here. Think of it like this, if the search engine reads the word, “here” versus, check out the latest tweet from the techymarketer. The search engine does not know if the resulting page fulfills the link label’s promise to readers, i.e., no way of knowing if this is a good or bad link. If you are linking to great content that readers should visit, you should get some credit–a notch on your belt. You get the most bang for your buck if you do it the correct way. Make sure you hyperlink words that are descriptive of what readers can expect to see when they click your links. Consistently providing quality content is a strong determinant in your credibility for search engines. When visitors show they trust what you say with page views and link backs, search engines take notice. Speaking of credit: joining forces with a content syndicator is a great way to maximize your reach. However, when you syndicate your content on another’s website, they receive the credit. That’s why they do it for free. It tells search engines that their site is the place to visit to learn about novel ideas. They receive all the hits and viewers keep going there first because the Search Engine Results Pages (SERPs) point them there. Great if you are just starting out, or, if you are contributing a one-off piece to gain new readership for your own blog or website—entertainers do it all the time. But maybe not the best idea if you have a fairly established brand of your own, as you are potentially cannibalizing your own search engine traffic. Perhaps an option is to initially align with a syndicator, then once enough readers commit to your voice, re-work the terms of the agreement and introduce canonicalization. Search engine optimization is forcing better content creation—follow suit or get left.